Following on from the successful Stick V8 we now have the SMOK Stick V8 Baby. The brand themselves, SMOK, or Smoktech need little introduction. They have been among the biggest players on the market for a number of years now, but they became particularly known for their products in the recent past. Hardware such as the X Cube mods or TFV4 tank, or slightly more recent TFV8 tank. SMOK are responsible for some of the greatest current devices on the market, the list keeps going, but my favourites are a mind boggling 350W GX350 box mod that can be paired nicely with even more mental TFV12 tank, and don’t forget about perhaps the most popular kit out there – SMOK Alien. SMOK matured greatly as a company in the last year, they have been producing devices with varying amount of power – from 50W max to 350W and finally they released something truly for starters, the Stick V8 and Stick V8 Baby, which in particular we’re going to talk about today. More recently they have also released the SMOK Stick V9 Max, reviewed here. But don’t be put off by it being a “starter kit”, it can offer much more than a vape pen that you may be used to! Now this is where it gets slightly interesting, there are actually two versions of this tank now, one is standard (the one I’ve got) and the EU version, to comply with TPD regulations. Smok keeps the streak of surprising me with their devices, the Stick V8 Baby is not an exception. It’s extremely well built as always, the material is superb both on the battery and the tank. If there’s anything to complain about, it would be the button – it’s made of shiny plastic, which instantly feels cheap compared with the rest of the device. The airflow adjustment ring is very smooth and it stops from spinning all the way, which I always appreciate – it makes it very easy to unscrew the tank from the battery. The top cap is the smoothest out of the TFV8 family too, I own the Big Baby Beast and the Cloud Beast and they both feel unreasonably restrictive. How Does The SMOK Stick V8 Baby Perform? As mentioned above, Stick V8 Baby has 2000mah capacity in its non-removable battery. Battery life is very impressive, at work it easily lasts me 2 – 2.5 days on one charge with the 0.25ohm coil. With the 0.15ohm coil, discharge rate is higher due to the lower resistance, so the battery lasts slightly shorter, about a day and a half in my case. Just to give you a point of reference, that’s a normal working day, with breaks every hour or so, “chain vaping” for 5-10 minutes. The only downside, with the battery being non-removable, is the fact that you can’t use the device while it’s charging. And it takes quite a long time to charge from the Micro USB port. It feels like it’s charging at 0.5A rate, which isn’t amazing, but also isn’t anything out of the ordinary. A week into using the 0.15ohm coil, the flavour was mostly gone – it was time to try out the 0.25ohm coil. It’s very easy to replace coils in SMOK tanks, but it’s a messy process, so prepare some tissues or run the tank under the tap water, if you’re certain you won’t be using the coil anymore. Open up the juice fill hatch to get some leverage while unscrewing the top part. Once that’s done, take the glass off and the coil is exposed. Once you’ve put the new coil in place, don’t forget to prime it. It might be a tedious process, but don’t underestimate the effect with stock coils. Drop some juice directly on the cotton on the inside, but try not to get it in the hole in the middle, or you will have some juice spitting back at you. You can tell that it is juiced up by looking at the cotton in the juice holes on the outside of the coil – it should be saturated with e liquid. Put the tank back together, fill it up and let it sit for couple of minutes to allow any of the dry cotton to soak in the juice. To my big surprise, when I replaced my first coils, the wire was very black on the inside, I must have not primed it well enough. A week is about the right lifespan for these coils, sometimes less, sometimes more. Unfortunately it seems like the quality with SMOK coils is hit and miss. I’ve had stock coils die in a few days. As I already mentioned above, you get two coils in the box – 0.15ohm and 0.25ohm. I didn’t think much of 0.15ohm coil. Yes, it does produce a good amount of vapour for such a little device, but flavour was very disappointing and it went through e juice too fast for my liking. Once I started using the 0.25ohm coil, my interest in the Baby Beast came back. Flavour is slightly better. Still ways to go, but it’s a start. There’s some decent throat hit, which I do expect from a starter kit targeted at cigarette quitters. 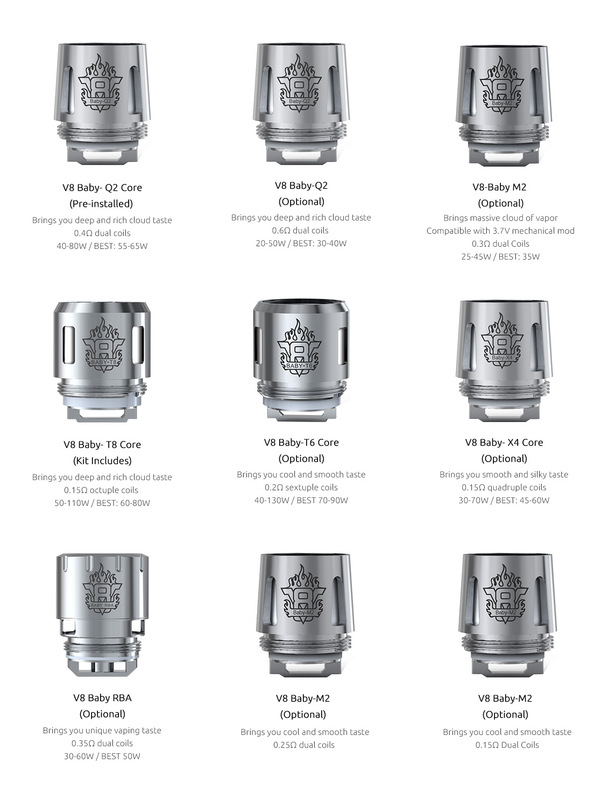 There’s a variety of TFV8 Baby coils available, ranging from 0.15ohm to 0.6ohm. Most of these aren’t very suitable for the Stick V8, as they require a bit more power. But the V8 Baby-Q2 – 0.6ohm coil looks interesting and should suit the Baby tank. I like how easy the mod is overall, there’s no need to worry about adjusting power for different coils. The light blinks? Charge it, turn it on and it works. This is especially great for beginners – it’s good enough to give you a head-start without learning too much theory behind vaping. With so many great things about the Stick V8 Baby, I just don’t like charging it. The charge indicator is too difficult to see. Since it’s off when the battery is fully charged, if you just quickly glance at it from across the room and don’t see the red light, there’s a good chance that you will be disappointed when you take a closer look and the mod is still charging. It also takes its time to charge, leaving you without the vaping device in the meantime. The SMOK Stick V8 Baby is not my typical device, after all it is aimed at beginner vapers. You can’t adjust the power, it realistically doesn’t go beyond 50W, it has a built-in battery… I love it! It’s very refreshing to take a small step back and leave the crazy power-hungry coils along with the bulky multiple battery mods. I will repeat this again, it’s a very simple to use device – just one press of a button to give you more than you need from vaping. And… Would I replace it if I lost or broke the device? I would really consider either buying another V8 Baby or the full Stick V8, just for the sake of trying out a different product. Baby Beast tank. It’s simply the best, most well-rounded tank out of the TFV8 line, in my opinion. Purchased this pen on a Friday by Monday the first coil had gone by took it back to shop where they put the other coil in by Tuesday afternoon the second coil had gone. Not impressed. I bought the Smok V8 baby about 3 weeks ago and I really dislike it. It leaks like a sive, it burns my lips because it so hot, and there is no warning when the battery is about to die. It just stops…mid vape. Or come morning, its dead, when it worked fine just before bed. I dont understand how people rave about this thing and why its getting so many great reviews. Worst vape pen I’ve ever owned. 1 – screw the coil onto the chimney, you can only turn it so far as end of the threads. This is what makes the BB and BBB leak 90% of the time, 10% is bad coils that dont seal well or to low VG liquids. 2 – screw the base onto the coil, closing the tank. 3 – close all air vents, I use a rubber glas ring over the air vents. 4 – Edit (tested with RTA, X4 and Q2) fill it up with e-liquid. (have had 0 problems with 90/10, 80/20, 70/30 or 50/50. 6 – whatever u do don’t blow out of the tank, u are re-listing the pressure inside and that is why u get more leakage…. Does it leak, fed up with tanks that leak through the air vents. SMOK tanks actually got a lot better in my opinion. None of them leaked for me in an upright position. I’ve had the Cloud Beast lay in the drawer for over a month with some juice in it and it was still fine. There might be occasional drop or two, but nothing major, like I’ve had happen with TFV4. If you make sure the the coils and everything else is tight, you should be fine. I have only used this tank with 70VG liquid or higher, but it shouldn’t be too bad with thinner liquid.